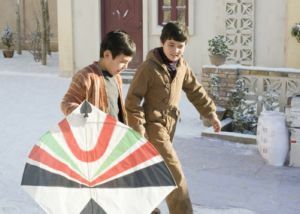 The release of The Kite Runner was held over into the New Year after originally being slated for Boxing Day, and for once this decision seems sound – competition for attention among the major releases may have meant this remarkably moving film was overlooked by most of those who hadn’t read the Khaled Hosseini novel. In pre-invasion (Russian, not Allied Forces) Afghanistan two young boys grow up in Kabul – one is the son of a wealthy man, the other of that man’s servant. They share a love of kite flying, dreaming of winning kite battles together, and are best friends in spite of their differing statuses. When an act of racist brutality occurs, their friendship is forgotten with betrayal leading to their separation. Later, a chance for redemption comes at a cost, and the true measure of their bond is identified. Focussing so closely on a relationship between boys is fraught with difficulty, and yet director Marc Forster manages to coax heart-wrenching truth from both his young leads. Zekeria Ebrahimi (Amir) and Ahmad Khan Mahmidzada (Hassan) are excellent, with never a moment of doubt or uncertainty in spite of their inexperience and the horrific nature of some of what they must perform. They are joined by Homayoun Ershadi, as Amir’s father Baba, who excels in a complicated role. Khalid Abdalla as the adult Amir rounds out the leading performers with a subtle strength, but it is truly Mahmidzada as Hassan who steals the attention. Hassan is filled with such honour, never doubting that the strength within his friend Amir will become clear and his faith will be rewarded. It is rare that a performance by a child will elicit such emotion, and it will be a hard soul indeed who isn’t moved in witnessing the beauty of Hassan’s loyalty and self-sacrifice. Mahmidzada is brilliant and brave; his performance gives Hassan dignity and honour in spite of the remarkable horrors he must face. Screen portrayals of religious fanaticism are often prone to caricature, yet it is films like The Kite Runner that inform us of its true effects. The terrifying changes that are represented as occurring in Afghanistan during the Russian and Taliban eras are almost a sidenote to the individual story of redemption that forms the heart of the film: it is in the personal stories that one sees the real damage done. Forster treads lightly, allowing for quiet moments filled with meaning to convey his characters and their story, and later sequences featuring the Taliban are filmed honestly without ever resorting to hyperbole. He has succeeded in making a film that is informative without being preachy, entertaining and moving without being overtly manipulative. This rather remarkable story is filmed beautifully, and should move many to tears – childhood friendship is rarely portrayed so effectively. Highly recommended.